My husband and I decided to get married on the Big Island of Hawaii 3 years ago and we fell in love with it. This is where we wanted to live someday. How could we make this happen sooner than later??? Our family has been into roasting,preparing, and drinking great coffee for about 10 years, so my husband thought what better way to come full circle with this than to purchase land in Hawaii and grow our own coffee to send back to our own roasting facility and cafe. So last November we closed on Mauka Lau Farm in Honokaa Hawaii. It was an old 5 acre Japanese farm that had not been touched in about 15 years so in essence…. we bought a jungle with what once was a great 3 bedroom farmhouse which now had trees growing through it. I got to see it for the first time in April and, yes I was a little taken back…it needs LOTS of work. But it is AMAZING! It already had about a hundred mature coffee trees on it but you could barely get to them and they were about 20 ft tall!! (They should be about 7 feet tall). They just had been left to grow out of control, and there were so many seedlings popping up everywhere because of the coffee seeds just dropping to the ground and well,…growing. 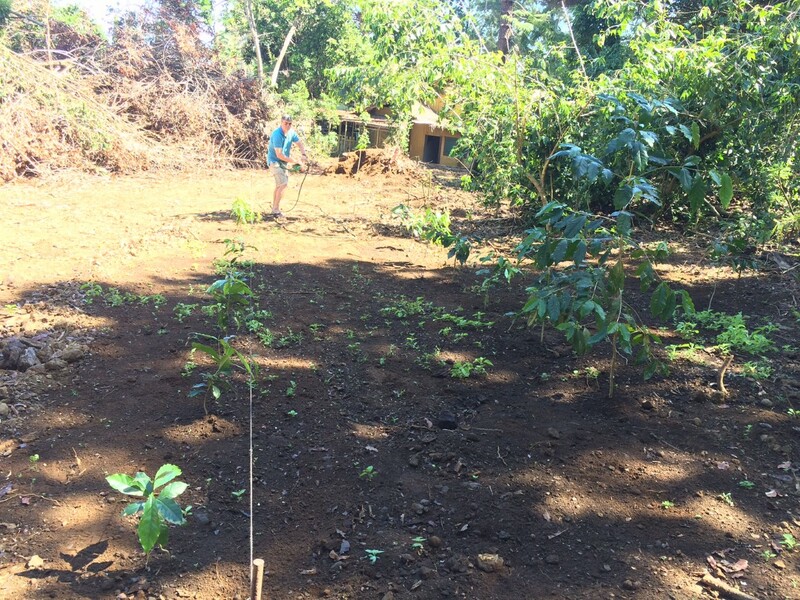 So above is a patch of land that we cleared on the property and my husband has planted his first 10 trees from seedlings he replanted. He will get to see them again in September when he goes back and although these trees won’t produce any cherry for another 2 years, he hopes to pick,process and ship home 100 pounds of green coffee from the other mature trees that are there. So get ready Saratoga! This is as organic farm to cup as it gets!